Type 071 landing platform dock, Changbai Shan (989), at Nieuwe Waterweg, Rotterdam. Image courtesy of kees torn. Kunlun Shan (998) LPD was commissioned into service in November 2007. Image courtesy of Navy Office of Legislative Affairs. A close forward view of the Changbai Shan (989) LPD. Image courtesy of Ministerie van Defensie. The fourth LPD in class, Yimeng Shan (988), was commissioned in February 2016. Image courtesy of Emperornie. Type 071 landing platform dock (LPD) is a new class of amphibious warfare vessels built by Hudong-Zhonghua Shipbuilding, a subsidiary of China State Shipbuilding Corporation (CSSC), for the People’s Liberation Army Navy (PLAN). The Type 071 LPD is primarily deployed in amphibious landing missions and can also conduct humanitarian aid and civilian evacuation missions. The first LPD in the series, Kunlun Shan (998), was launched in December 2006 and commissioned in November 2007. Jinggang Shan (999), the second vessel in the series, was floated out in November 2010 and was inducted into service in October 2011. The third ship in class, Changbai Shan (989), was launched in September 2011 and entered service with the PLAN in September 2012. Yimeng Shan (988) was launched in January 2015 and commissioned in February 2016. 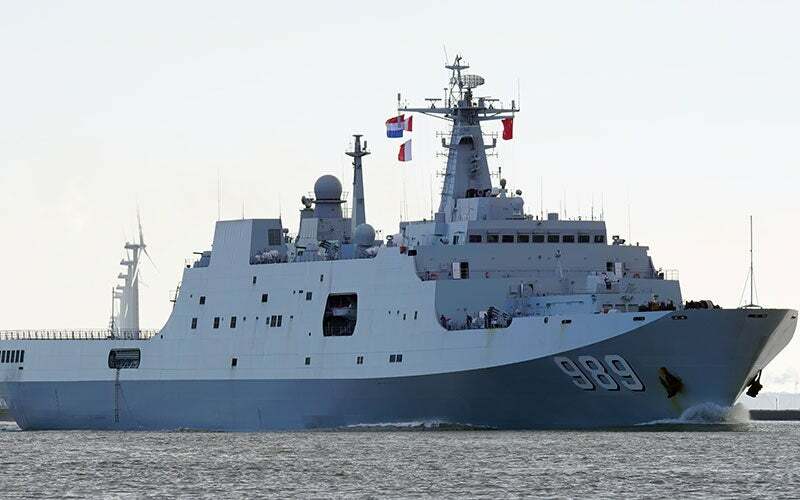 A modified variant of the Type 071 LPD was offered by the China State Shipbuilding & Trading Corp (CSTC) consortium for the Royal Malaysian Navy. Type 071 LPD ships feature a unique hull platform offering a large dock space. The ship also offers a dedicated space for medical care and is equipped with a fresh water supply system. The stabilisers fitted to the vessel reduce roll and improve the stability in high sea states. The high volumes of internal space support the installation of additional communications systems, which make the ship a fleet command and control centre during amphibious operations. The Type 071 LPD has a length of 210m, beam of 28m and a draft of 7m. The full load displacement of the vessel is 25,000t. The amphibious warfare ship features a vehicle deck, well-deck, landing deck and a hanger. It can carry a combination of marines, vehicles, landing craft and helicopters. The vehicle deck can house amphibious assault vehicles including ZBD05 amphibious IFV, and ZTD-05 amphibious assault tracked armoured vehicle. The stern ramp, two side doors and ramps allow rapid loading of the vehicles and equipment. The well deck houses up to four landing craft air-cushioned (LCAC), which can transfer vehicles or marines to the shore at high speed. The LCAC are launched by flooding of the docking area. The vessel can also carry landing craft on port / starboard davits. The stern helicopter deck offers two landing spots for supporting the operations of two Z-8 (SA 321 Super Frelon) transport helicopters. The twin-door cantilever hangar can house up to four Z-8 helicopters. The LPD also has the capacity to carry a marine battalion, including up to 800 marines and associated equipment and supplies. The bow deck is installed with an AK-176 76mm naval gun system. The vessel is also armed with four 30mm AK-630 close-in weapon systems (CIWS). Countermeasures are provided by four 18-tube Type 726-4 decoy or chaff launchers. "The Type 071 LPD is primarily deployed in amphibious landing missions and can also conduct humanitarian aid and civilian evacuation missions." The Type 071 LPDs are powered by integrated combined diesel and diesel (CODAD) propulsion, controlled by an automated propulsion control system. The propulsion system integrates four Shaanxi 16 PC2.6 V400 diesel engines driving two controllable pitch propellers through twin shafts. Each engine produces a maximum power of 35,197kW. The power-plant provides a maximum speed of 25kt and a range of 10,000nmi at 18kt. The maximum endurance of the vessel is 60 days.